“This is the city, Los Angeles, California. I work here. My name’s Friday. I carry a badge. …” Dragnet, on radio (1949–1956) and television (1951–1959 & 1967–1970,) broadcast the adventures of Sergeant, later Lieutenant (then, back to Sergeant,) Joe Friday (portrayed by Jack Webb,) who carried badge 714. Wait … although this is “Just the facts, Ma’am,” this story is not about that Joe Friday. This is about a Hawaiian, Joe Pōʻalima (his last name translates to ‘fifth day, Friday,’) who was better known as Joe Friday. Ok, let’s step back in time and move up the coast from our first Friday’s Pacific coast beat to a place just below the 49th parallel. San Juan County in northwestern Washington is an archipelago of hundreds of islands, reefs and rocks between mainland Washington and Vancouver Island (accessible only by water or air.) Around 20 islands are inhabited. The largest three – San Juan, Orcas and Lopez – contain most of the land area and nearly all the population. San Juan Island is the second-largest and most populous of the San Juan Islands. The name “San Juan” originates from the 1791 expedition of Francisco de Eliza, who named the archipelago Isla y Archiepelago de San Juan to honor his patron sponsor, Juan Vicente de Güemes Padilla Horcasitas y Aguayo, 2nd Count of Revillagigedo. This area was the ancient home to the Northern Straits Salish, including the Lummi, Samish, Saanich and Songhees, who settled this place around 10,000-years ago. The intersection of three waterways and sheltered harbors, prairie and woodlands with abundant food sources provided a seasonal home to its early occupants in winter villages of large cedar plank longhouses, who dispersed in the warmer months to fish, hunt and maintain and harvest shellfish beds and upland gardens. Fast forward a bit … Hudson’s Bay Company (HBC) was a fur trading company that started in Canada in 1670; its first century of operation found HBC firmly-focused in a few forts and posts around the shores of James and Hudson Bays, Central Canada. Needing supplies on their journey, the traders soon realized they could economically barter for provisions in Hawai‘i; for instance any type of iron, a common nail, chisel or knife, could fetch far more fresh fruit meat and water than a large sum of money would in other ports. On January 21, 1829 the Hudson’s Bay Company schooner ‘Cadboro’ arrived at Honolulu from Fort Vancouver with a small shipment of poles and sawn lumber. The Company was attracted to Hawaiʻi not for furs but as a potential market for the products of the Company’s posts in the Pacific Northwest. That first trip was intended to test the market for HBC’s primary products, salmon and lumber. Another goal of the trip was to recruit Hawaiians for HBC operations on the Northwest Coast. As early as 1811, HBC had already hired twelve Hawaiians on three year contracts to work for them in the Pacific Northwest. The Hudson’s Bay Company claimed San Juan Island in 1845, building a salmon curing station there in 1850. Several years later, the company started a sheep farm. That brings us to the second Joe Friday, mentioned above. Later census records note Peter Friday living in San Juan County, Washington Territory. The 1880 census shows a Peter Friday, age 50, with five children, the eldest of whom was called Joseph Friday, born around 1844. Oh, one more thing about Friday … following a conflict and boundary dispute between the US and British/Canadians (the Pig War,) the Hudson Bay Company moved its operation. “The Kanakas were all dismissed, some of them (settled) on the Island, but most of them went back to the British side of the Island called Saltspring Island. The few that stayed on San Juan were those that had married Indian women, and had families. 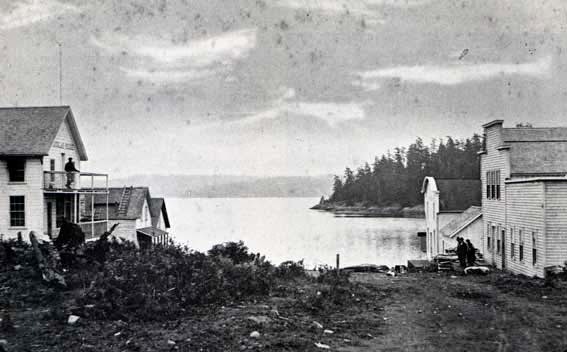 The image shows Friday Harbor in the 1880s. In addition, I have added some other images in a folder of like name in the Photos section on my Facebook and Google+ pages.